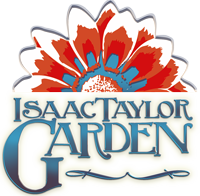 Click image to download pdf for printing info about Isaac Taylor Garden. Please read and print out Rules & Policy. A Carolinian wrought iron gate welcomes visitors to the garden. Walk over a beautiful pattern of old clay bricks. The brick entrance and patio were laid in the early 1900's, along with a path through the garden. Sit under the shade of mature trees cascading over the natural ambiance of southern foliage. A full staging area for catering food and beverage in the main building. Beautiful private setting with rich history. 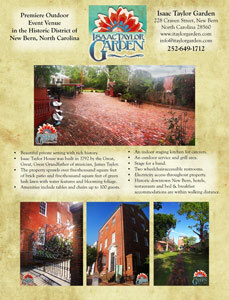 Isaac Taylor House was built in 1792 by the Great, Great, Great Grandfather of musician, James Taylor. The property sprawls over five-thousand square feet of brick patio and five-thousand square feet of green lush lawn with water features and blooming foliage. Amenities include tables and chairs up to 100 guests. An indoor staging kitchen for caterers. An outdoor service and grill area. 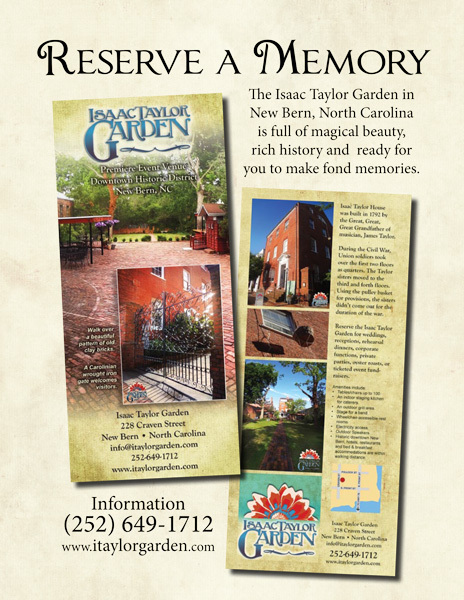 Historic downtown New Bern, hotels, restaurants and bed & breakfast accommodations are within walking distance.